Fintech and regulation are no longer opposing forces. 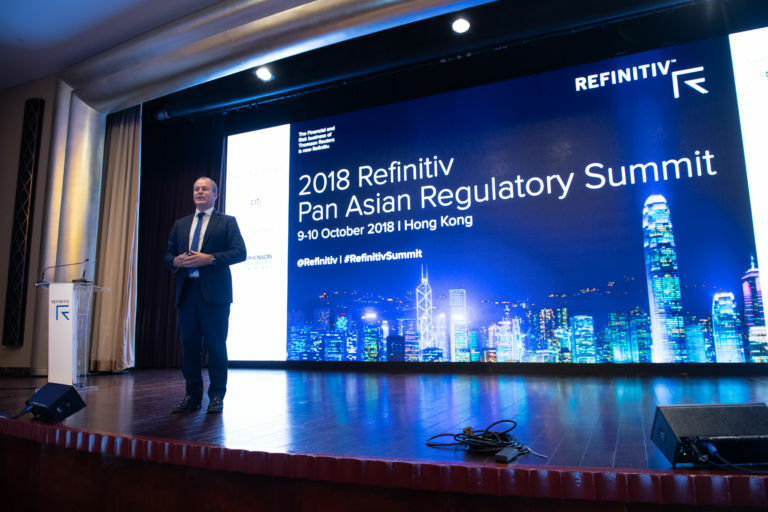 The Refinitiv Pan Asian Regulatory Summit held in Hong Kong in October 2018, discussed the value of regulatory partnerships and the use of technology in the region to combat financial crime, streamline compliance and improve cybersecurity. The 9th Pan Asian Regulatory Summit considered the benefits of cross-border partnerships and technology in tackling financial crime and cyber threats. Financial institutions continue to grapple with balancing compliance with new data regulations, as well as managing their Anti-Money Laundering (AML) and Know Your Customer (KYC) regimes. Regulatory technology will see greater co-operation in the future, fostering responsible innovation. Technology has become the lifeblood of financial services, driven largely by the exponential rise of fintech and techfin. 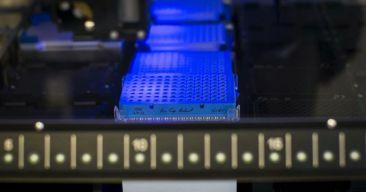 This is a welcome development, but one that presents a challenge to regulators in protecting the industry from technology’s dark side, without stifling innovation and progress. 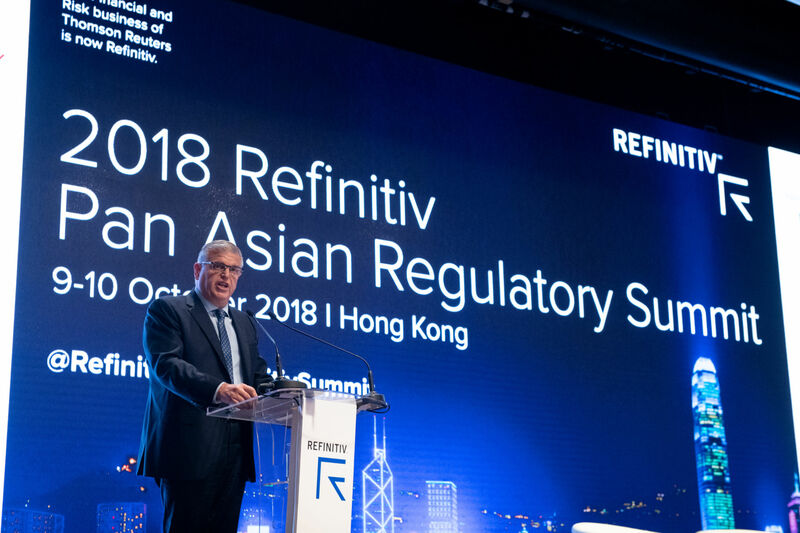 The 2018 Refinitiv Pan Asian Regulatory Summit, held in Hong Kong, brought together regulators and industry experts to explore these themes and delve into technology’s impact on the regulatory environment now and in the future. 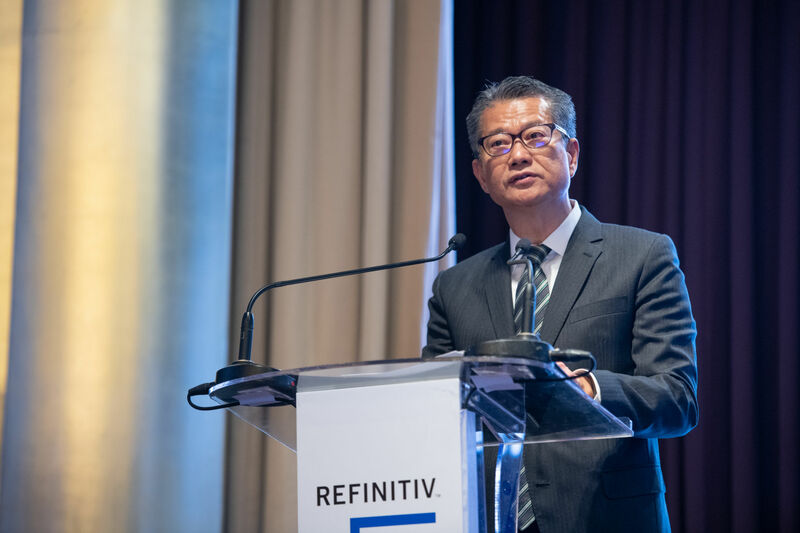 A recent Refinitiv report estimated that financial crime costs about US$1.45 trillion in lost turnover. 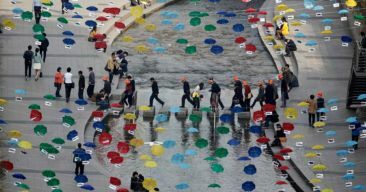 Additionally, firms spend US$1.3 trillion fighting it, and nearly half of the Asian companies surveyed reported being a victim. 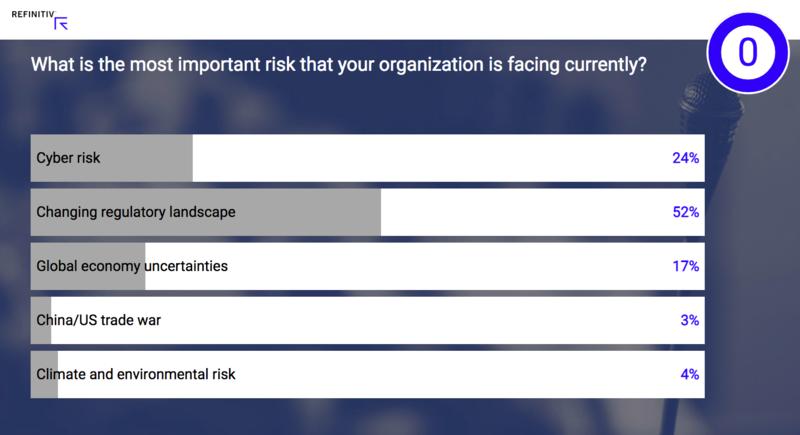 These statistics found an echo at our Pan Asian Regulatory Summit, where most attendees picked anti-money laundering regulations as the most pressing concern for their organization. 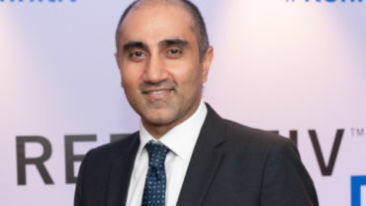 Indeed, technology is transforming the industry in ways that were unimaginable a few years ago, a point that was acknowledged repeatedly during the conference. Another abiding theme was regulators’ changing attitudes to disruptive technology as they forge partnerships and share resources and knowledge, to manage a rapidly evolving sector and combat supranational risks. 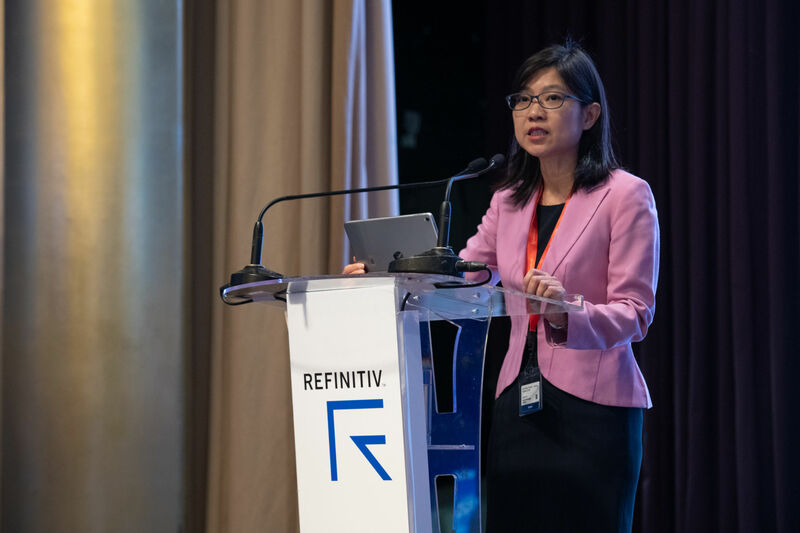 “Technology has a lot of potential to make AML/CFT controls more effective and efficient”, observed Carmen Chu, Executive Director, Enforcement and AML at the Hong Kong Monetary Authority (HKMA). This distinction was highlighted by a discussion on the digital transformation of Hong Kong’s financial sector, which focused on the city’s efforts to develop the virtual banking sector. 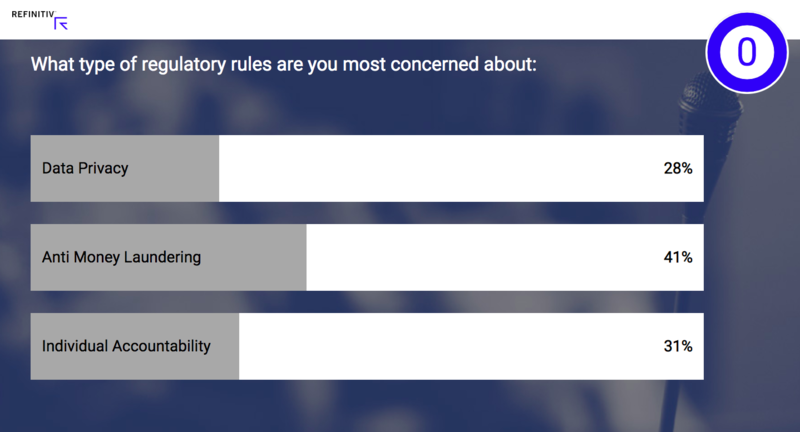 The urgent need to achieve policy equilibrium in this environment was stressed by a poll where most attendees picked a changing regulatory landscape as their key concern. 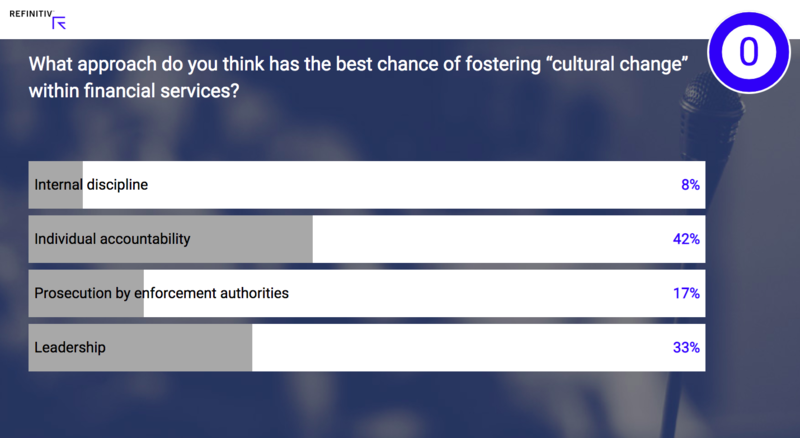 The good news, however, is that governments around the world, like in Hong Kong, are collaborating with each other, embracing tools such as Big Data, blockchain and AI to manage risk, and building testing environments to encourage innovation. “A compelling change seen in the last few years is that regulators are actually competing to build the best sandbox”, said Stuart Ward, Director for Financial Services, APAC at Salesforce. Just how much regulators the world over are coming around to accept technology’s disruptive nature was emphasized by a discussion on developments in the crypto space. Acknowledging the industry’s nascent nature, panelists observed that regulators are increasingly keen to understand the myriad crypto products and their capabilities in addressing issues such as money laundering and KYC, and welcomed regulators’ efforts in developing sensible regulations. 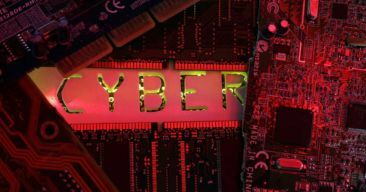 Regulators have their work cut out in framing policies that balance protecting the industry, fostering growth, and preventing bad actors from exploiting technology for the wrong reasons. “Individuals have a right to data privacy but this conflicts in an environment of tech criminality”, Craig said, highlighting a key dilemma regulators face. Noting that criminals will always exploit privacy features such as the ‘right to be forgotten’ and ‘expressed consent’, Craig argued for policies that enable information-sharing crucial to combating crime, without sacrificing privacy. 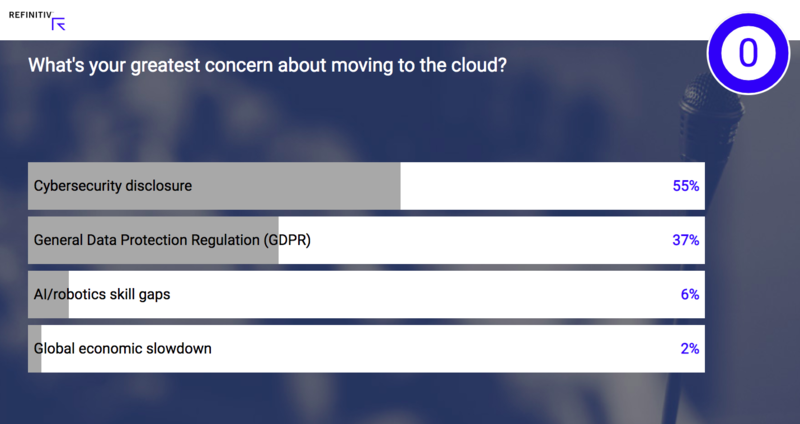 The barriers posed by current regulations to technological advancement were underscored by an audience poll that showed that organizations are especially concerned about cybersecurity disclosures and compliance with the European Union’s General Data Protection Regulation (GDPR), when considering a shift to the cloud. 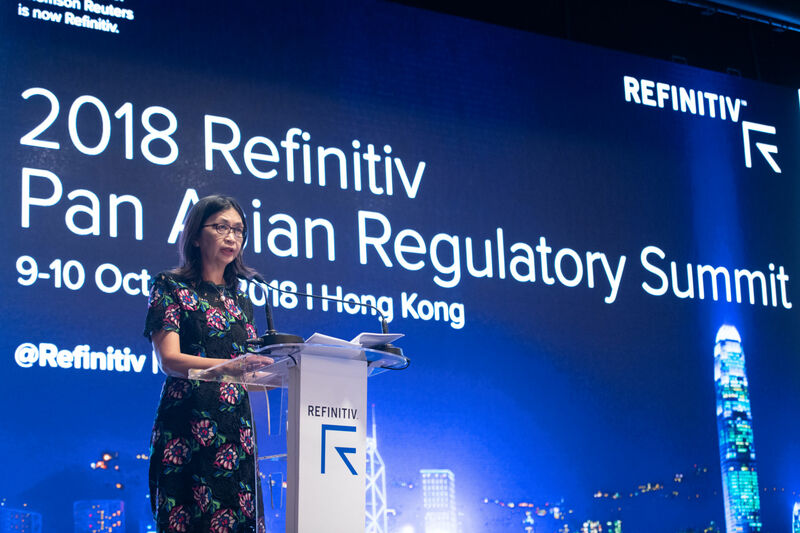 This could be especially challenging in Asia where approaches to privacy issues differ across markets, according to Vivienne Artz, Chief Privacy Officer at Refinitiv. “So trying to find a bridge between GDPR and what’s going on in Asia is very challenging”, she said. 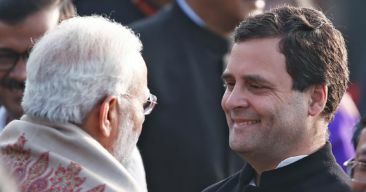 Regulators also have to consider the matter of regaining consumer trust, declared the panel on conduct management and regulation. “There is a loss of trust in our institutions and that trust has to be earned back by action”, claimed Justin O’Brien, Director at The Trust Project. 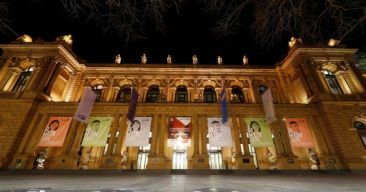 This view was backed by a poll that showed that holding people in power accountable was viewed as the best approach to rein in misconduct and excessive risk-taking, and restore trust in the financial system. On a macro level, international cooperation is the best defense against protectionism and regulatory arbitrage, according to Megan Butler, Director of Supervision – Investment, Wholesale and Specialist, at the UK’s Financial Conduct Authority. “It’s absolutely imperative that we don’t slip into a model… with competing philosophies and fragmentary regulatory agendas”, she said. 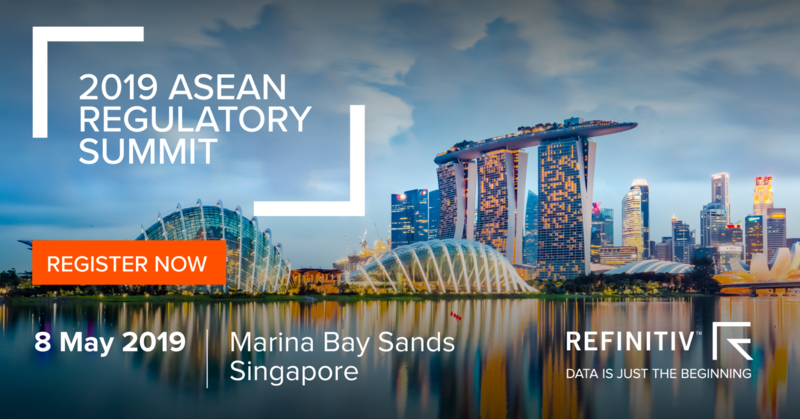 Overall, the Pan-Asian Regulatory Summit provided wide-ranging and insightful discussions on the financial services industry’s changing regulatory landscape and how it’s adapting to the geopolitical and technological forces reshaping the sector. “Financial technology and regulation are often billed as opposing forces. 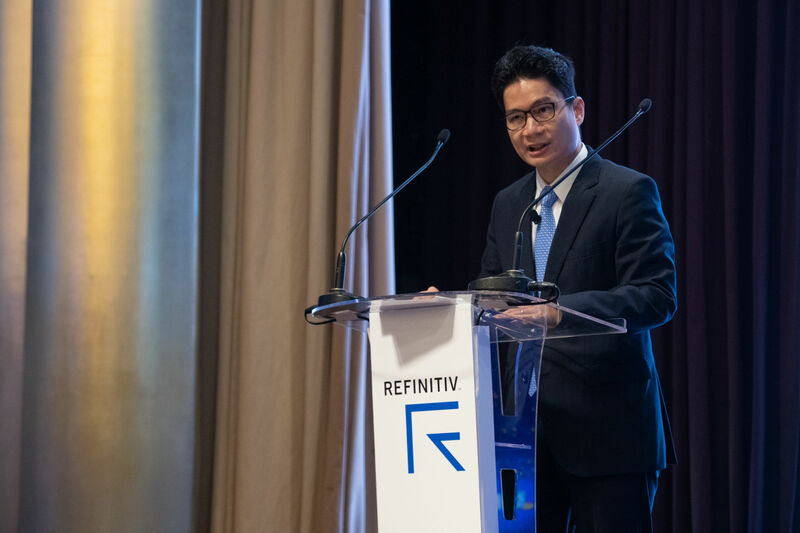 Regulation maintains order in the financial system while the innovative face of fintech offers immense promise and fresh regulatory challenges”, stated Paul Chan, Hong Kong’s Financial Secretary, neatly summing up the overarching issue facing the industry. The event shed light on the progress being made by the international community towards managing risk and building a strong, safe and trusted financial sector for the future. 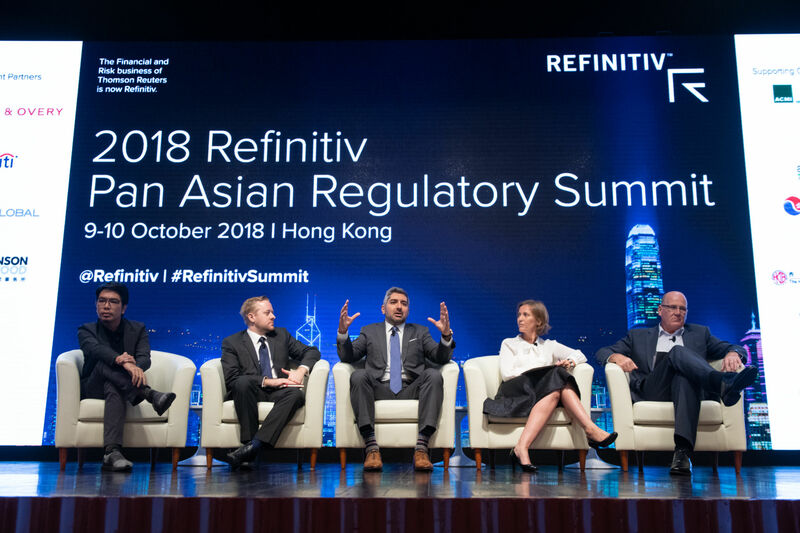 As Julia Walker, Head of Market Development, Risk, Asia-Pacific at Refinitiv, put it: “Big partnerships are coming in RegTech… and, the sheer amount of dialog happening with regulators is really exciting. 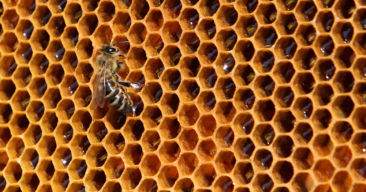 There is going to be a lot more transformation, so watch this space”.